eVacuumStore.com is the exclusive authorized online retailer of the Electrolux Preferred Line canister vacuums including the EL7070 UltraOne and the EL7066 UltraSilencer Delux. Both genuine Electrolux vacuums have premier attachments for an easier cleaning experience. Both vacuums also use high quality S-level filtration bags as well as HEPA filters providing 99.97% efficiency against particles down to .03 microns. The UltraOne and UltraSilencer share many similarities as the top two Electrolux canister vacuums including: ergonomic handles, crushproof hoses, and a superior power nozzle. Users control the suction level on the handle as well as turning the brush roll on and off. The UltraOne features an automatic suction setting that caters to the surface in question. The machines use the same power nozzle which comes with height adjustment. If you own an Oriental rug or thick pile carpet, then you need a power nozzle with height adjustment. For hardwood floors or bare surfaces (tile, laminate, etc), the vacuums come with a hardwood floor brush. This attachment has soft bristles to never scratch or damage hardwood floors, but rather to sweep up dust and dirt lying in the cracks wearing away slowly at the surface dulling its shine and vibrancy. While you clean, you never need to worry about disturbing anyone in your home. As the name implies, the UltraSilencer is one of the quietest machines available today operating at under 67 decibels. This low volume allows users to run the machine while others sleep. The UltraOne, although slightly louder, runs at roughly 72 decibels which is still silent enough to vacuum while people sleep or rest. The UltraOne boasts two features over the UltaSilencer. The design in which the hose enters the canister optimizes airflow; the debris enters the canister horizontally providing unmatched suction power as opposed to dust entering at an angle seen in the UltraSilencer. The UltraOne also has a larger dust capacity requiring a long lasting S-class bag reducing the number of replacements necessary to continue running. 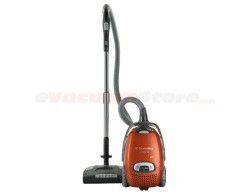 eVacuumstore.com stands as an exclusive online retailer of the Electrolux vacuums in the Preferred Line. These superior machines make cleaning worries a matter of the past and keep a hopeful future possible with seven (7) year warranties. To help determine which vacuum suits your needs, call the Electrolux experts at eVacuumStore.com today at 866-972-8227 and find your way to the ideal canister.